1. Piriformis Stretch: Lay on your back, bend your knees to place feet flat on floor. Place your right ankle on your left knee and pull your left thigh towards chest. Hold for 30 seconds. Repeat on the other side. 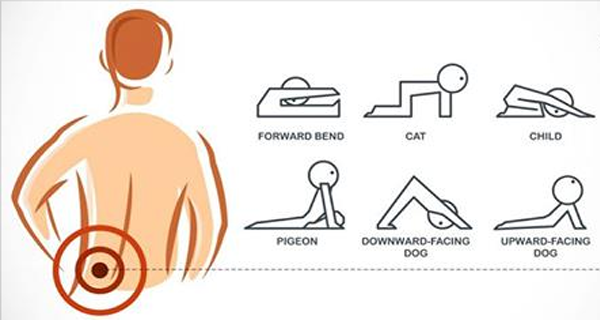 You should feel your lower back and buttocks stretching, which reduces back pain. 2. Seated Hip Stretch: Sit with legs outstretched. Bend your right knee and cross it over your straight left leg. Now keep your back straight and tug your right knee towards your chest. Hold for 30-60 sec. Repeat on other side. 3. Pigeon Pose: Sit in dog pose. Bring your right knee forward and bend it outward making sure the outside of your shin rests on the floor. The left knee should be stretched backwards. Hold for 5-10 breaths. Repeat on other side. 4. Self-trigger Point Therapy: Here you can use a tennis or lacrosse ball to apply pressure on your lower back. First locate the point of pain, place the ball under that point and keep it pressed against the flood. Hold for 30-60 sec. Then shift to another spot.